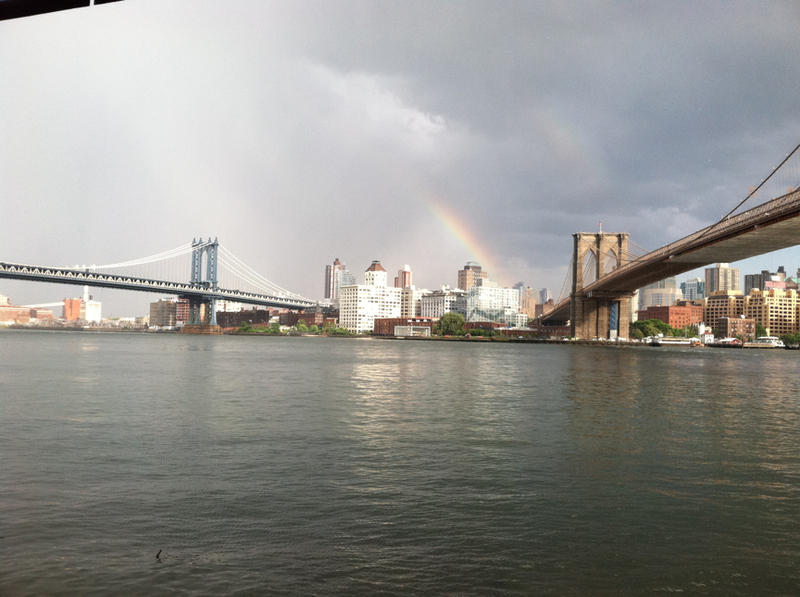 June 21, 2015 I didn’t work on the bridge today. 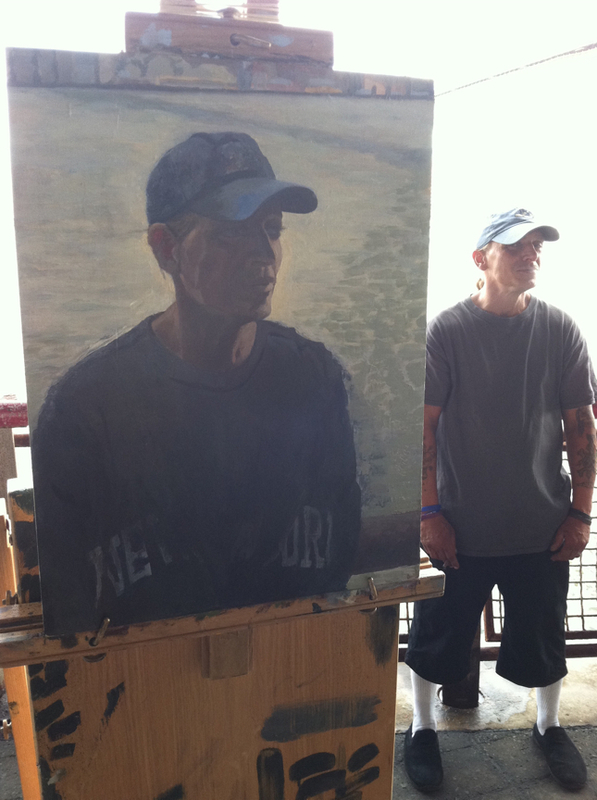 I finished the small portrait of Juan and started a bigger one of him sitting on the bench with his shirt off. I want to paint his tattoos and the giant scar on his belly. He did the tattoos himself with a piece of metal guitar wire in prison. “Hate” on the knuckles of his left hand with “Hate” tattoos on his left arm. “Love” on his right knuckles with “Love” tattoos on his right arm. The scar is from one of two gunshot wounds. He said it happened when a drug deal went bad in the projects in Williamsburg Brooklyn in 1984. Last touches on this one. On the first day, he had his NY hoodie. On the second day he didn’t. He said he slept in the park one night and the next morning he woke up and his backpack had been stolen. His NY hoodie was in the backpack. Then he wore a blue long sleeve shirt but that one went missing too. 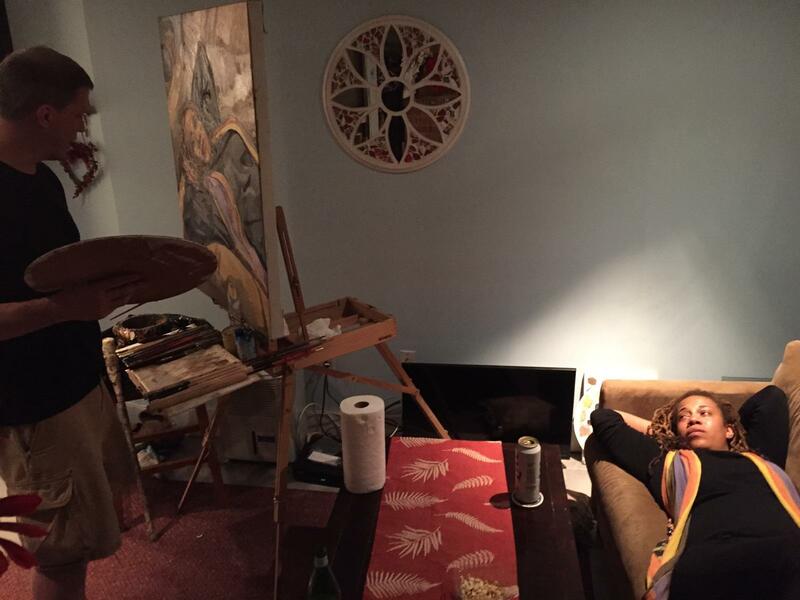 June 21, 2015 He said, “I want you to call this painting, “Juan Martinez Outlaw”. This entry was posted in Uncategorized on June 22, 2015 by johnmitchellworld. 5/24/2015 Photo by Jolanda de Waal. Jolanda de Waal was on a two week vacation in NYC from the Netherlands with her sister. We had a nice conversation about the Netherlands and the history of Netherlandish painting. Photo by passerby Nakeisha Stewart. In 1993 I was in “Advanced Painting Studio” with Ray Yoshida, Ted Halkin, and Michiko Itatani as an undergraduate student at The School of the Art Institute of Chicago. Ray Yoshida would frequently clip articles about art and artists out of magazines and newspapers and pin them to a bulletin board near the exit. 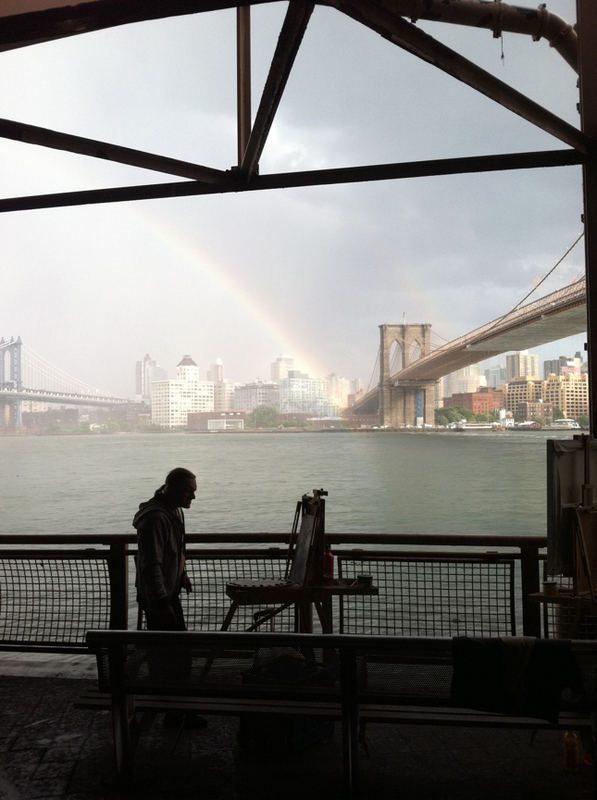 One day in March, he posted a New York Times article titled Malcolm Morley, Keeping Painting Alive. I read it over and over again during the time when it was posted. After a few weeks, one late night – I swiped it. It’s still hanging in my studio. It sets my imagination on fire and makes me want to paint. 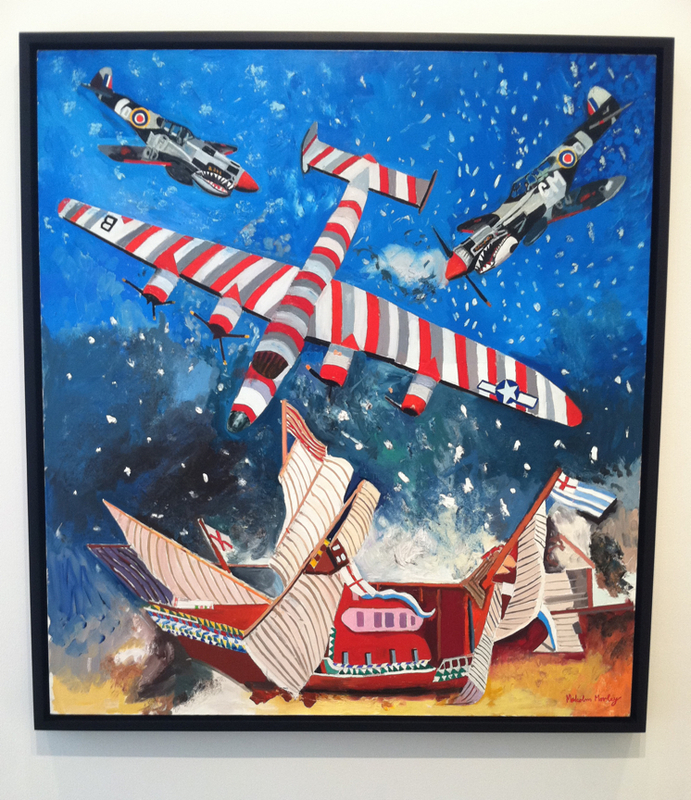 As a graduate student of painting and printmaking at Yale in 1997, I managed to convince my class that we should invite Malcolm Morley as a visiting artist. Since inviting him was my idea, I had the privilege of hosting him; which meant showing him around, taking him out to dinner, and driving him back to the train afterwards. The first thing he saw as we came off of the elevator in the Paul Rudolph Art and Architecture building onto the 4th floor that morning was a copy of the article Ray Yoshida had posted in 1993. I had pinned it to an announcement board under the banner of “Visiting Artist”. He skimmed the article and then asked, “Can I get a copy of this? I don’t have one.” During his time in my studio, I showed him several still life paintings of toys that I had been working on. He said, “You shouldn’t think of these objects as toys. You should think of them as models.” This simple statement completely flipped my whole way of thinking about what I had been doing. He also talked a lot about color and suggested that I try using a grid the way he does. Looking at his paintings in this current exhibition, I kept thinking of Malcolm saying, “You shouldn’t think of these objects as toys. You should think of them as models.” There’s a poetic multiplicity of meaning to every aspect of Malcolm’s work. 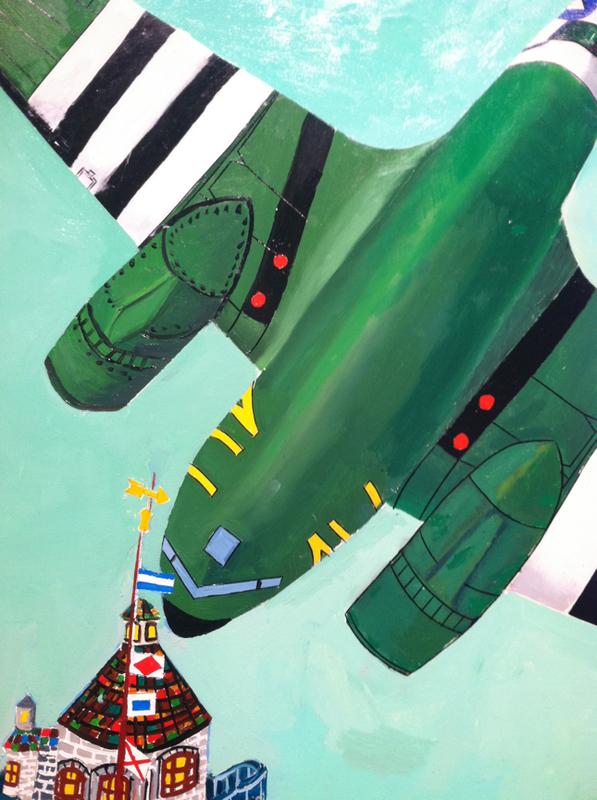 The spirit of playfulness in his painting is joyful and at 83, he’s charged with youthful vigor for his work – as his robust output over the past decade clearly demonstrates. Malcolm Morley was born in London on June 7, 1931. As with Pablo’s “Picasso” and Diego’s “Velázquez”, Morley is Malcolm’s mother’s last name. 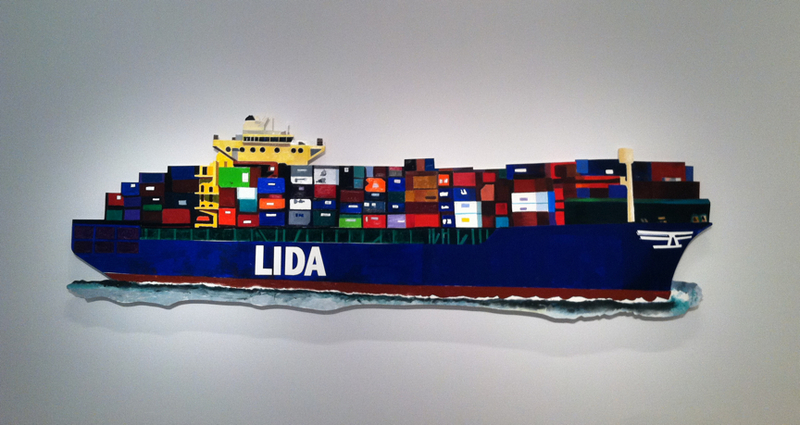 He lives in a converted church near Bellport, Long Island with his wife Lida whose name graces “Cargo Freighter Lida”, a painting on a shaped wood panel in the first room as you enter his current exhibition at Sperone Westwater Gallery in NYC. Malcolm Morley moved to the US in 1958 and became an American citizen in 1991. 1958 is also the year of Ronald Neame’s wonderful movie The Horse’s Mouth starring Alec Guinness, who plays a nutty painter named Gulley Jimson. Gulley’s paintings were actually made by the English painter – John Bratby. 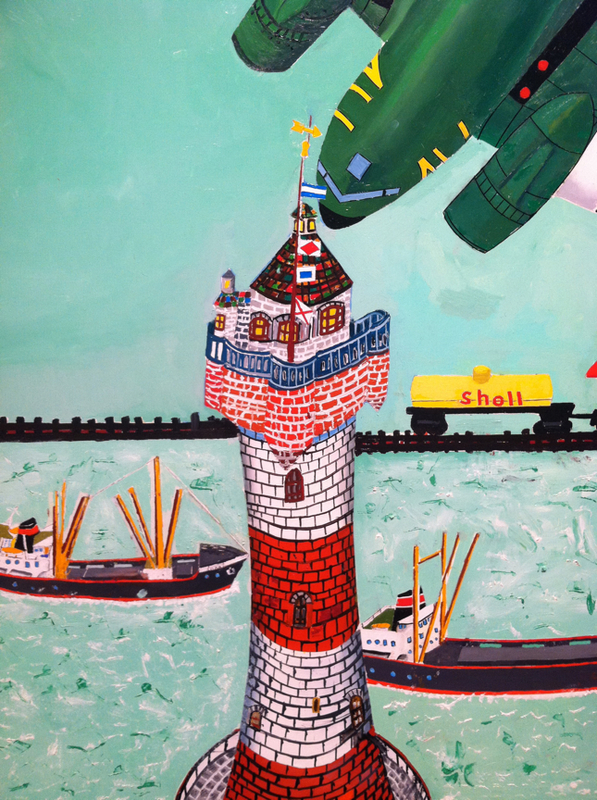 The Horse’s Mouth opens with Gulley being released from prison and ends with Gulley in a paint spattered smock, sailing away on the Thames River on his house boat, arm extended, thumb up, and eyeballing the hull of a gigantic passing ship as if he wants to make a painting of it. 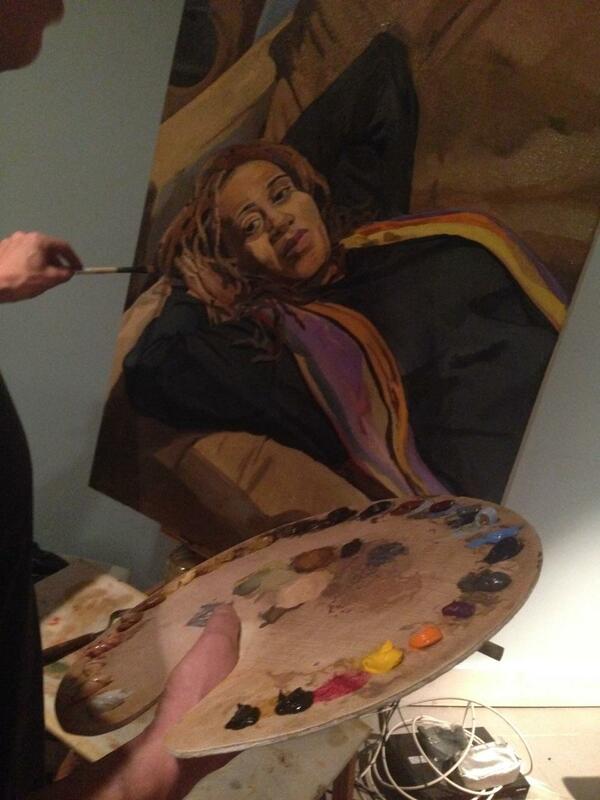 Malcolm often talks about how he learned to paint in prison. The Horse’s Mouth opening must have resonated with the young Malcolm Morley. Could the final scene have been inspiration for Malcolm Morley’s abstract paintings made between 1958 and 1964? Another topic of discussion in my studio in 1997 was the way I was using the glass tabletop palette and the effect it was having in the paintings. I would rarely clean my palette between painting sessions. The glass was loaded with dry layers of paint from edge to edge. Week old paint might skin over but I would still use it. I’d break the skin with the brush and paint with whatever wet paint was underneath. 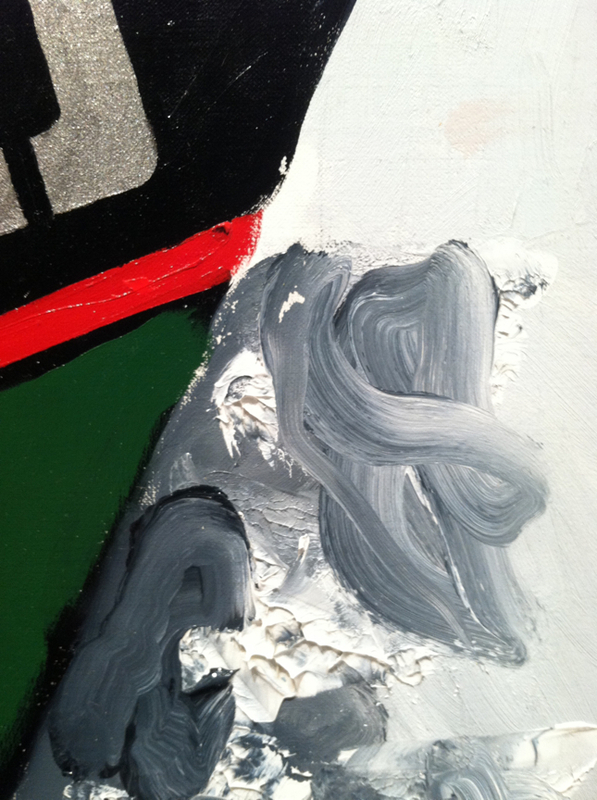 Chunks of the dry paint skin would mix into the wet paint resulting in what Malcolm referred to as “boogers” on the surface of those paintings. He said, “You know, paint is like bread. Nobody wants a stale loaf.” After that, I started keeping a clean palette and now I only paint with fresh paint. And this is something that is striking about Malcolm’s work; the paint is always daisy fresh. There was a point in his life when he decided not to layer new oil paint over old oil paint, but to only paint in one layer over the white ground. This aspect of his painting seems connected to his British roots. 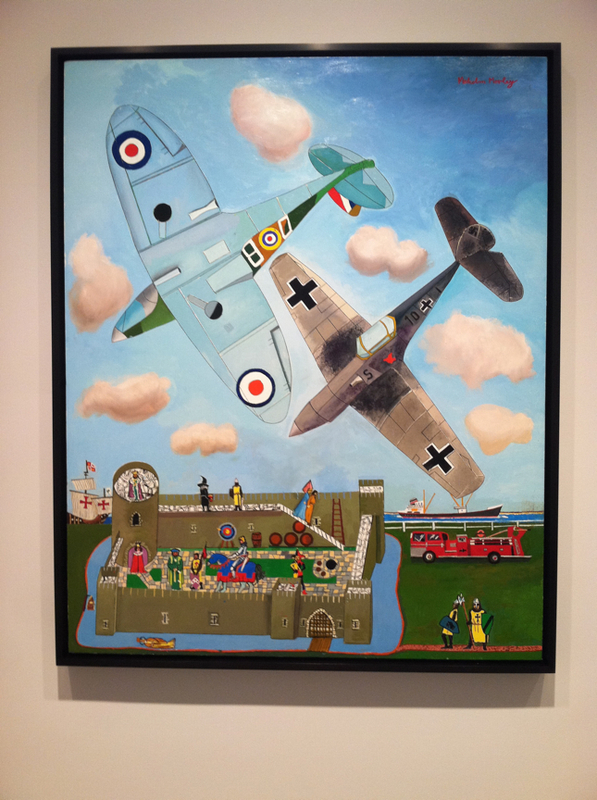 Lucian Freud was 9 years older than Malcolm Morley and made paintings this way too. 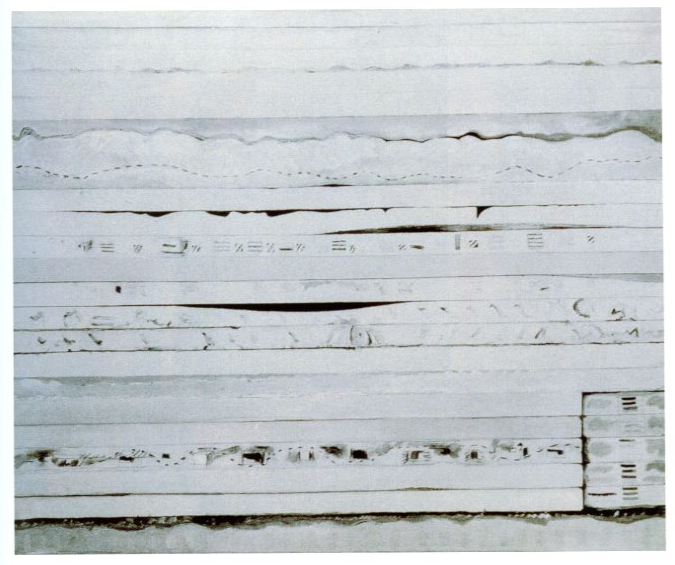 There are photos of both Malcolm Morley and Lucian Freud’s unfinished paintings where some under-drawing is visible and a portion of the surface looks complete. Lucian would draw directly from the subject in three-dimensional space. 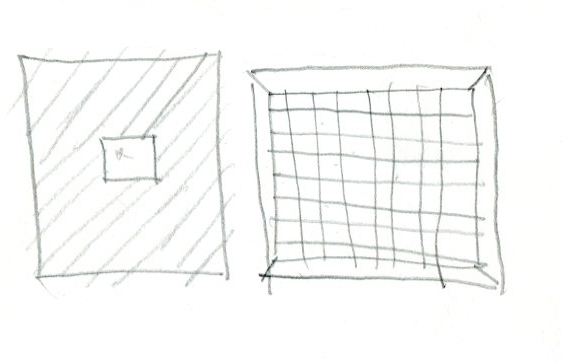 Malcolm’s under-drawing typically consists of a grid with line drawing taken from within a corresponding grid over his model image. In many of Malcolm Morley’s paintings, the white of the ground and drawn grid lines underneath are visible. He’s been using the grid since his student days in London. 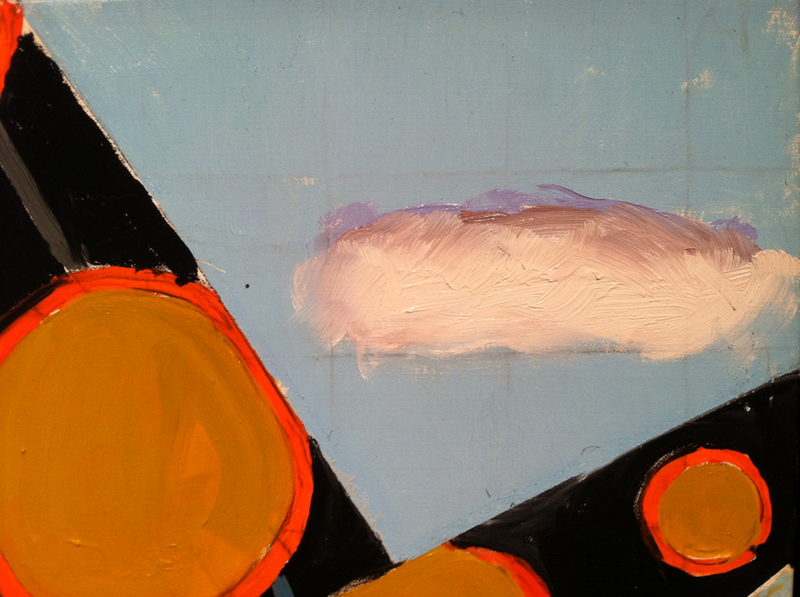 For example, in the current show there is a cloud in “Freighter with Primary Colors and B2 Bombers” that appears locked within the lines of two graphite grid cells showing through from beneath the single layer of oil paint. Something that I’ve learned from paying close attention to Malcolm Morley’s painting (and John Ford’s movies) is the importance of where the horizon line is and how it works within a composition. In this current exhibition, three paintings have no horizon line, they’re titled “Aircraft on a Yellow Plane”, “Airlock”, and “The Island of the Day Before Regained”. In “The Island of the Day Before Regained” the implication of no horizon seems to indicate that we’re dive-bombing the central airplane and the beached sailing ship – both of which are seen from above. In the context of Malcolm’s world when the world seems to be made of toys, looking from a high vantage point recalls the feeling of looking down as you might look down at a child’s toy castle with figurines on a tabletop or on the floor. 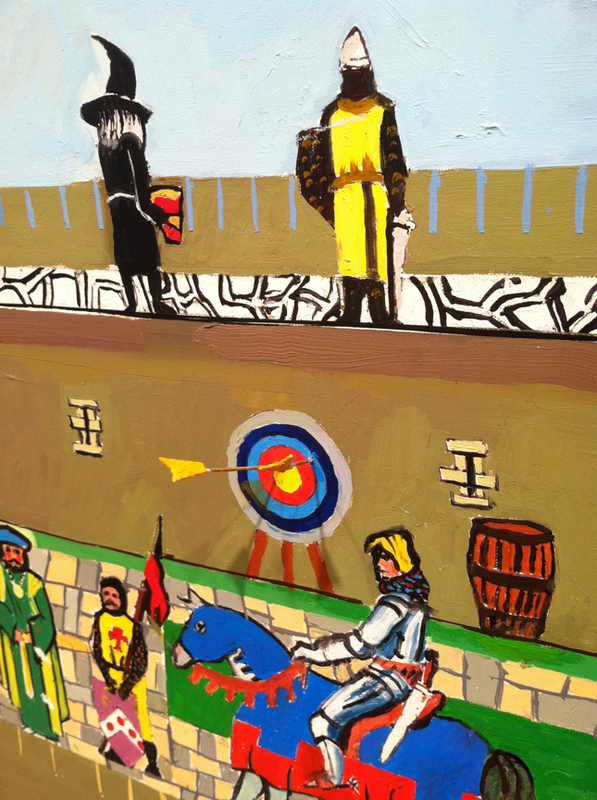 In “Air Battle over Medieval Castle” everything below the low horizon line is juxtaposed on a strong vertical or horizontal axis with the exception of two figures that appear to be walking down castle stairs and one knight on the outer path who is bent at the knees and looking up. Above the horizon are 7 puffy clouds that are all close to the same size and 2 fighter planes with noses pointed down. The lower German plane’s bottom wing seems to rest on 3 gold bars rising from a freighter ship. The intervals of space between the objects above the horizon line and the dynamic angles juxtaposed against the stability of things on the ground, create a feeling of vertigo. 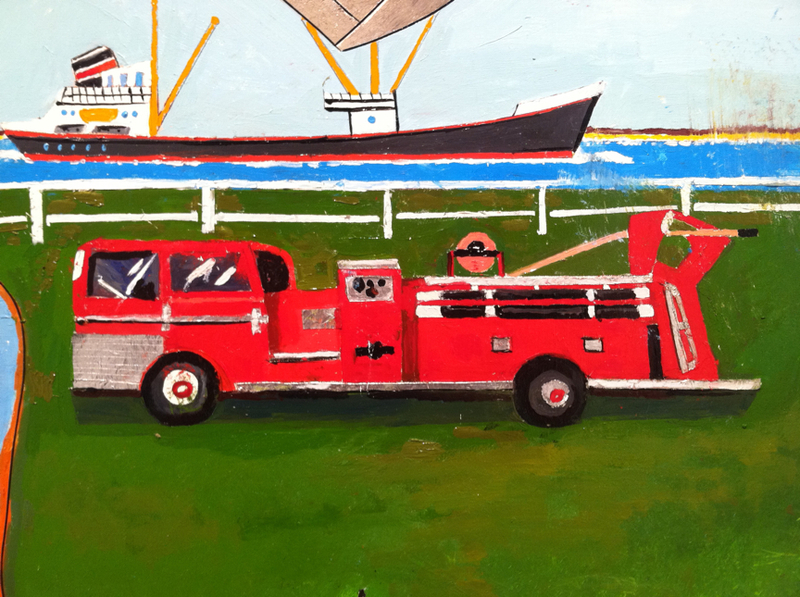 The fire truck is detailed with silver leaf and an archery target on the far castle wall has two 3D model metal arrows sticking out of it. This round target shape repeats in what appear to be barrels stacked and seen from the top, a table, the wheels of the fire truck, and insignia on the upper airplane. My favorite use of the horizon in this group of new work is in a mostly spearmint green painting titled “Dakota” with a toy (model) three car train on an uneven horizontal track that serves as a horizon line set below the midline of the painting over a sparkling calm sea. The part of the track that is to the viewer’s left of the lighthouse does not match up with the part of the track to the right of the lighthouse. The track on the left is slightly higher. As far as I know, this way of making space in a painting was invented by Cézanne. If you focus your eyes on the lighthouse and let the uneven train track horizon drop into your peripheral vision, the uneven track seems to suddenly line up. This optical illusion creates the sensation of space between the near lighthouse and the horizon that appears to pass behind. The spirit of a child at play is reiterated by the train’s three-car arrangement being out of order; the caboose is in the middle with the oil tanker at the end. The word “Shell” appears on the oil tanker car and the “Shell” logo appears on the engine and the caboose. In this context, the use of the “Shell” symbol echoes Giorgio Morandi’s paintings of shells. White sea shells painted in muted earthy colors during WW2 when, as Janet Abramowicz says in her book “Giorgio Morandi: The Art of Silence” – “…allied bombers attempted to destroy the crucial knot of railways in Bologna that had provided the Nazis with a steady flow of supplies from Germany to its army in Italy.” The minty American plane is splendidly asymmetrical. Notice for example, how different the left engine is from the right. 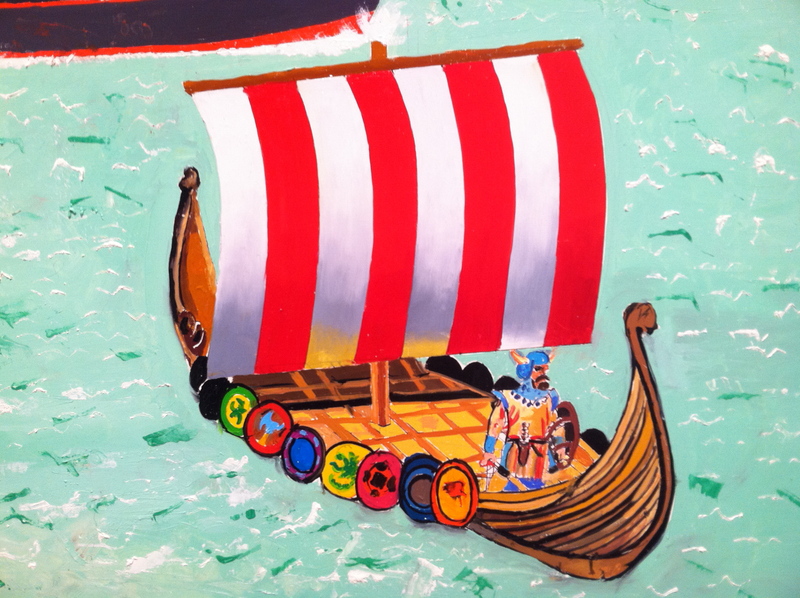 The black and white stripes on the wings bounce off of the red and white striped lighthouse and Viking ship sail. Even though he says that he has suffered stage fright in his studio at times, I love that there seems to be no fear in his work. In a time when so many painters strive to build a recognizable brand – Malcolm never did that. As Vicki Goldberg said in the New York Times article in 1993, “…he is a painter’s painter and a maverick who does not fit tidily into categories.” Malcolm Morley is a hero because he has been willing to risk everything for the sake of tapping into something bigger than his conscious self, something that is hard to define and impossible to pigeon hole. And in the end, despite giant changes in his work at various points throughout his career and bold leaps of imagination – Malcolm Morley’s work is always recognizably his own. 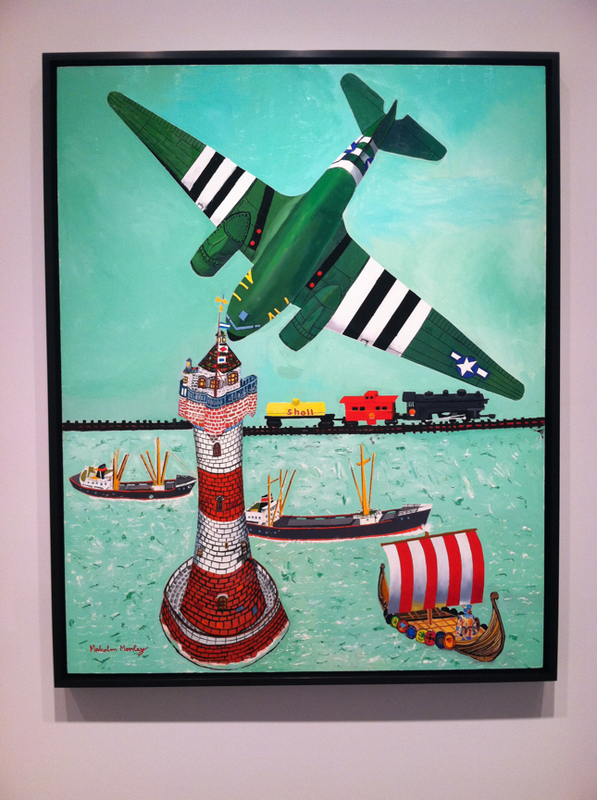 For his previous Sperone Westwater show “Rules of Engagement” in 2011, Malcolm Morley painted himself as “Biggles” in an airborne dogfight. Biggles was the fictional heroic fighter pilot and main character in the Biggles books by W.E. Johns. The pulp series lasted from 1932 to 1968 and was a favorite of Malcolm’s youth. 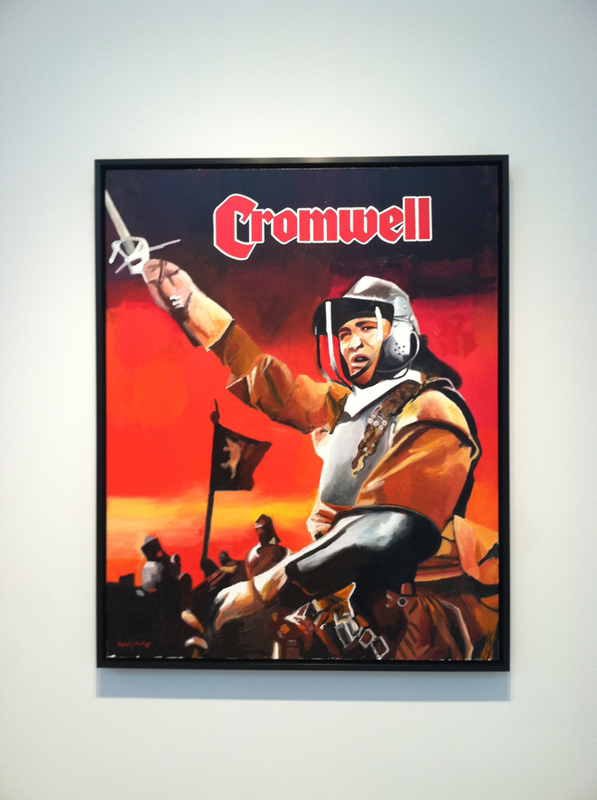 In the current exhibition, the face of the knight on horseback in ”Cromwell” also looks like a self-portrait. When I first saw the painting, I didn’t know much about Oliver Cromwell. My immediate association was with “Crom” and Arnold Schwarzenegger as Conan the Barbarian describing what he expects it to be like after he dies and meets his god, the god of steel – “Crom”: “If I die, I have to go before him. And he will ask me, “What is the riddle of steel?” If I don’t know it, he will cast me out of Valhalla and laugh at me. That’s Crom.” In the first few minutes that I stood looking at Malcolm Morley’s “Cromwell” painting, I imagined Malcolm Morley going before the god of painting and being asked, “What is the riddle of painting?” This exhibition of 17 recent works proves once again that Malcolm Morley knows the answer and is destined to spend eternity with his painter pantheon in Valhalla. This entry was posted in Uncategorized on May 23, 2015 by johnmitchellworld.